You need a ride, someone else has a car and could use the cash, SideCar is the app that will bring you together. New instant peer-to-peer rideshare-finding app SideCar turns anyone into a taxi / Uber driver, and it’s supposedly legal because you technically volunteer to pay at the end. Today it emerges from beta for iOS and Android in its first city, San Francisco. The fact is that many cities (welcome to San Francisco) just don’t have enough taxis or adequate public transportation, but more and more, people don’t want to waste money on car payments, gas, insurance, and parking. SideCar hopes you’d rather pay that money to other citizens who already own a vehicle. 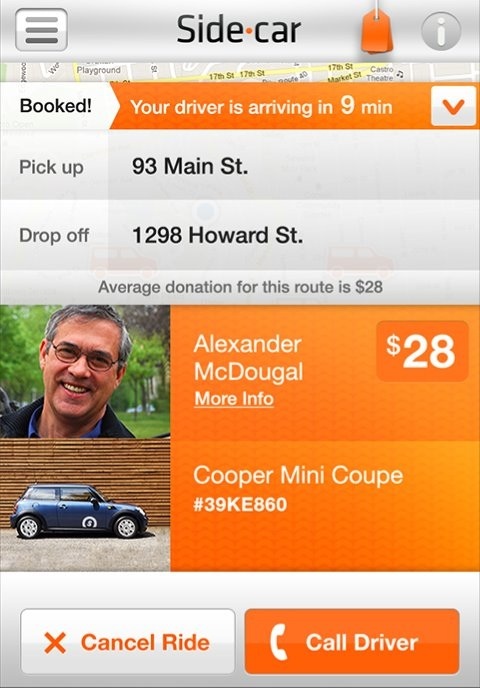 When you book a ride, SideCar shows the average amount people have paid their drivers for a similar trip. 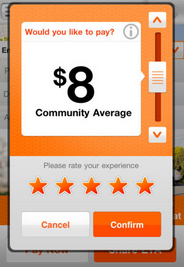 When you reach your destination, an in-app slider lets you volunteer to pay more or less. And not everyone’s a scrooge. In the 10,000 rides during its four-month private beta, Paul says “the vast majority of people do pay something”, and SideCar gets a 20% cut. Those cuts could add up quick if SideCar can solve its primary problem: awareness. It needs people registering as drivers and asking for rides. But it has help from some well connected seed investors, which include Spring Ventures, where Sunil Paul is a partner, Huron River Ventures, SV Angel, Lerer Ventures, First Step Fund, Jeff Clarke, Lisa Gansky, Robert Goldberg, Jared Kopf, Konstantin Othmer, Mark Pincus, Martin Roscheisen, Josh Silverman, and Thomas Varghese. It will also have to compete with more established transportation alternatives like peer-to-peer car rental services RelayRides and Getaround where you drive yourself, as well as centralized carsharers like Zipcar and City CarShare. You know, ones where you aren’t locked in a metal box with someone you don’t know. Another big roadblock? “We’re concerned about regulation. Regulation can be used the incumbents to slow down innovation and we’ve seen that repeatedly. Airbnb experienced that with hotel lobby. Long-term I think that’s a key obstacle” Paul tells me. Luckily, Paul has been trying to turn ridesharing into a business for over a decade, and has helped pass legislation in California to keep it legal. While it might seem a bit odd at first, I found SideCar to be almost as quick at finding me a ride as paying a professional limo driver and much cheaper. Depending on your generosity, it can also be a lot less expensive than a taxi. I still thought a trip from SF to Menlo Park was a little steep. It was fascinating booking a driver, giving him a heads up about what I wanted to pay, and haggling on the phone with him, even though I could have just stiffed him at the end. SideCar could produce some awkwardly silent drives, but then again, you might make a new friend. It’s certainly rewriting the social contract between passenger and chauffeur. While a random guy’s SUV won’t have the same classy feel as a Lincoln Towncar, SideCar lets you preview the vehicle you’re driving in, so If you have a couch to haul you might be able to score a pickup truck or minivan to deliver you. “We have multiple layers of safety. You have to have a valid credit card. As a driver we put you through multiple screens — background check for past criminal activity, license verification, insurance verification. We do interviews with drivers, and we train the drivers. Both [the driver and passenger] can rate each other. We’ve also got a rating system and investigate bad ratings. We’ve kicked out several drivers and at least a few passengers. And there’s the ETA mechanism, so when you’re hanging out with your girlfriend or sister and she orders a SideCar, she can send you a link that shows you where the car is as it makes its journey. We have to do what we can to build a safe environment knowing that bad things do happen. If SideCar can convince the world it’s safe, it could massively disrupt the auto industry, reduce traffic and carbon emissions, and bring people closer to their community. The stakes are high, and Paul’s gamble is with other people’s lives, but the roads have looked the same for far too long. 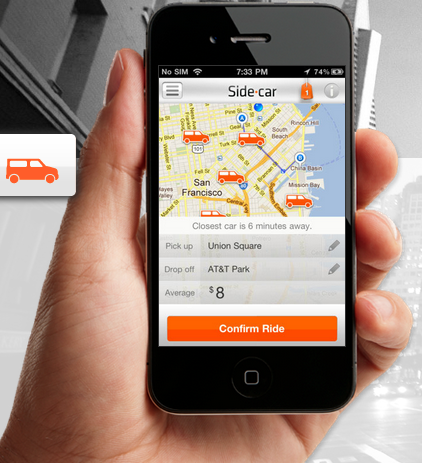 SideCar is now available for iOS and Android, but currently only has drivers in San Francisco.